The DIS-2 48/10 is a fully digital AC servo controller for three-phase synchronous and PM DC motors with a supply voltage of 24..48 V DC. The DIS-2 is optimally suitable for the decentralized employment. It can be mounted directly to the terminal block of the motor or used as a stand alone unit. There are a number of operating modes to choose from: torque, speed or position control. Programming and diagnosis are possible via an RS232 or CAN bus interface. The parameterisation program "DIS-2 ServoCommander™” can be used to quickly, easily and comfortably parameterise the DIS-2. 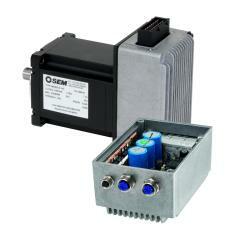 The DIS-2 320/2 series drive is suitable for integration with 320Vdc brushless servo motors. Typical range covers 100 to 300W. The DIS-2 48/10 series drive is suitable for integration with 24...60Vdc brushless servo motors.